CBLDF Warms Up for C2E2! We’re only a week away from Chicago’s celebration of all things geeky, C2E2! We’ve lined up an exclusive new t-shirt for the show, signed merch, panels, and much more for comic defenders! We’ll also have exclusive signings at CBLDF booth #409! Tune in next week, when we announce who’s going to be joining us! C2E2 is also a great opportunity to proclaim your support for the right to read comics by becoming a member of CBLDF! You’ll be rewarded with an array of membership premiums featuring artwork by Vanesa R. Del Rey! CBLDF is delighted to have a limited quantity of an exclusive t-shirt featuring the one and only Bone! 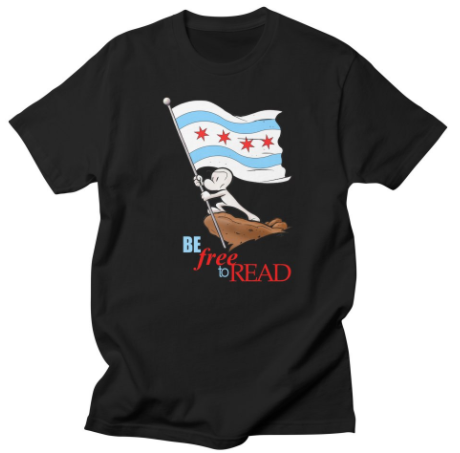 Jeff Smith’s iconic — and frequently challenged — hero waves the flag of Chicago and declares “Be Free to Read” exclusively for C2E2 attendees! There’s only a limited number of these shirts available, so make sure you stop by Booth #409 early to get yours — they’re only available while supplies last! Get a global look at comics censorship from CBLDF! See how the new political climate is affecting free speech in the U.S., with an abundance of local challenges to comics addressing diversity and equality. Explore how cartoonists are being prosecuted, threatened, and intimidated by authorities around the globe for making art. Learn how you can participate with CBLDF in making a difference and standing up for free expression! Meet the women who changed free expression in comics! From the turn of the 20th century to today, women have overcome censorship and more to make comics, inspiring today’s landscape of increasingly diverse and empowering comics storytelling. Join comics historian and 2016 Eisner Award judge Carol Tilley (University of Illinois), Lucy Knisley (French Milk, Something New, Relish), Janet Lee (Return of the Dapper Men, Northanger Abbey, Emma), and CBLDF Editorial Director Betsy Gomez (She Changed Comics) for an examination of the women who changed the format! C2E2 takes place April 21 – 23, 2017, at the South Building at McCormick Place in Chicago, Illinois. Come support the fight for free speech by visiting CBLDF at booth #409 all weekend!